For other locations by the same name in the Hawaiian islands, see Waimea (disambiguation). Waimea Bay is located in Haleiwa on the North Shore of O'ahu in the Hawaiian Islands at the mouth of the Waimea River. Waimea Valley extends behind Waimea Bay. Waimea means "reddish water" in Hawaiian. Captain Charles Clerke aboard HMS Resolution stopped at Waimea Bay on February 28, 1779. Clerke had shortly before taken command of the ship after Capt. James Cook was killed at Kealakekua Bay on February 14. Waimea Bay was the only O'ahu anchorage visited by the expedition. Waimea Valley was densely populated at the time, and the remains of Pu'u o Mahuka, an important heiau (Hawaiian temple) can still be seen above the bay. Pu'u o Mahuka Heiau State Monument is a Native Hawaiian historical site located just above the bay, off Pupukea Road. It is a historically important site on the North Shore, as well as providing a view of Waimea Bay and the Waianae Mountain range. Waimea Bay is located along Kamehameha Highway. The bay is on the north-west side of the highway (at the entrance point). In winter, Waimea and other North Shore locations such as Pipeline and Sunset Beach host a number of surfing contests because of the large waves found here. These waves are created by winter storms in the North Pacific, and their arrival on O'ahu's North Shore are typically forecast accurately several days in advance. In summer, Waimea typically has clear and calm water. The surf break at Waimea Bay was significant in the development of Big wave surfing. Larger surf at the bay went unridden for years until November 7, 1957 when a handful of surfers finally paddled out and rode the giant waves that break off the northern point of the bay. While the surf only breaks big several times a year, Waimea was the most prestigious big wave surf break in the world for decades. With the advent of tow-in surfing, more and more big wave breaks have been discovered that are far superior in quality to Waimea. However, the bay still holds a significant place even in today's world of big wave surfing. The Quiksilver Big Wave Invitational in Memory of Eddie Aikau takes place in Waimea Bay to honor the legendary surfer and the first lifeguard of the North Shore of Oahu. Since its inception in 1984, the tournament has only been held nine times, due to a precondition that open-ocean swells reach a minimum height of 20 feet (6.1 m) before the competition can be held. Open-ocean swells of this height generally translate to wave faces in the bay of 30 feet (9.1 m) to 40 feet (12 m). The most recent tournament was in February 2016. On January 28, 1998, Hawaii issued its first ever "condition black" legally closing all North Shore beaches including Waimea bay. The Quiksilver Big Wave Invitational in Memory of Eddie Aikau was canceled due to above average behemoth surf. The 1964 film Ride the Wild Surf and the Jan and Dean song "Ride the Wild Surf", which played at the end of the film and became a Top 20 National hit, made Waimea Bay famous. 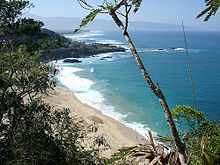 Waimea Bay is mentioned in the 1963 Beach Boys' song Surfin' U.S.A.
^ Pukui, Mary Kawena. Place Names of Hawaii. University of Hawaii Press. ISBN 0-8248-0524-0. ^ Lulham, Amanda (February 26, 2016). "John John Florence defeats Aussie Ross Clarke-Jones at big wave Eddie Aikau contest at Waimea Bay". The Daily Telegraph. Retrieved 26 February 2016.